An Elegant and Sustainable Solution to Erosion, Mud and Traditional Paving Techniques. Recycled plastic material reduces new plastic production and reuses material that will last. Less materials and labor means you cover more ground and save money in the process. Sections snap together for easy installation and solid fit with little or no cutting. Incredibly effective at stabilizing top soil to prevent water and wind erosion. Permeable panels allow water to drain which reduces runoff and creates a great place to fill with grass or rocks. 20 Year Manufacturer's warranty means we stand behind our products. Ecoraster E30 is perfect for all types of landscaping, including hardscaping and drought tolerant applications. It’s also great for projects around the house and garden like ponds, embankments and hot tub pads. Vehicular or pedestrian roadways and foot paths, large areas for events such as open-air concerts and outdoor fairgrounds, beer gardens and farmer’s markets in public parks, etc. 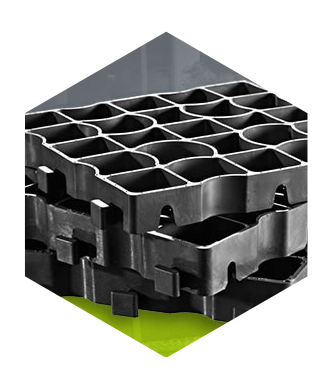 The Ecoraster E50 is perfect for heavy machinery and equipment access roads, turnaround areas, cattle squeezes and sorting chutes, high-traffic areas, gates, entrances to equipment storage and shops, etc.